The long awaited starting bell to the Alabama spring turkey season has come and gone for the WTR crew, and it was a better than expected weekend for the majority of the hunters we spoke to not only in Alabama but parts of Mississippi. With the cold weather we experienced throughout late February and early March in west Alabama, we expected to have somewhat of a late spring. As recently as March 12, low temperatures plummeted into the twenties, which usually means temporary lockjaw for Cotton State gobblers. Very little gobbling was heard early last week, giving turkey hunters little encouragement that the opener would be productive. During the middle part of last week, daytime temperatures began to rise into the 60’s, giving the turkeys a little boost that would carry us into the Friday opener. 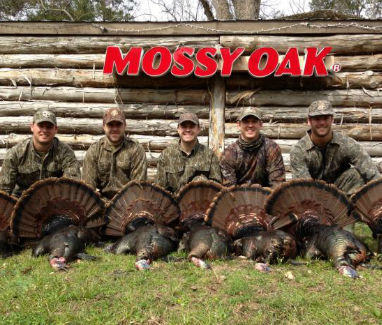 In the Mossy Oak camp, seven longbeards were killed over the weekend, and each hunt was a good gobbling hunt with multiple gobblers coming in. Reports from South Alabama said much of the same regarding bunched up gobblers, and our own Harris Oppenheimer killed an afternoon gobbler that had seven other longbeards with him. It appears that Alabama turkeys are very bunched right now, with many groups having four to five longbeards grouped up with multiple jakes and nearly a dozen hens. As the season progresses over the next week to ten days, and some of these “super groups” begin to break up, look for a flurry of solo “kamikaze” gobblers that gobble well and respond quickly, as well as wads of jakes to be a problem (chasing off the longbeards). Until next time, good hunting folks!